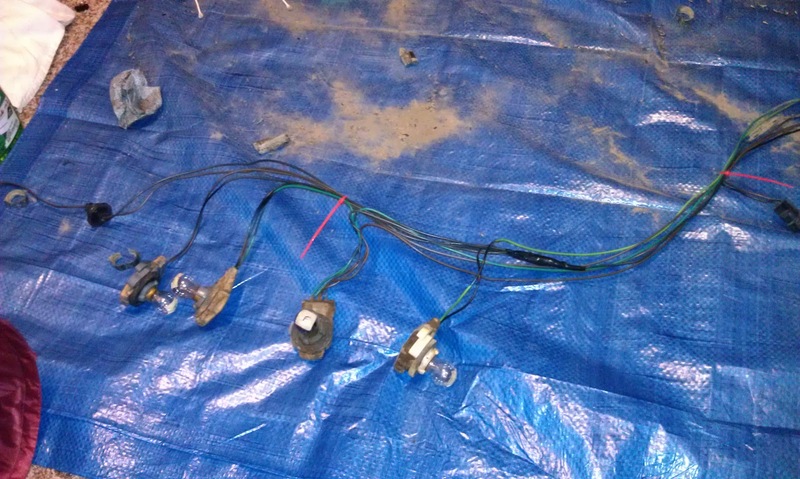 Once the outer loom was removed, I started with a small section of wiring and the plug on the far right, which happens to be the side marker light bulb. I tried cleaning the wiring and socket the best I could first with the all-purpose cleaner and then with the Gojo Fast Wipe. 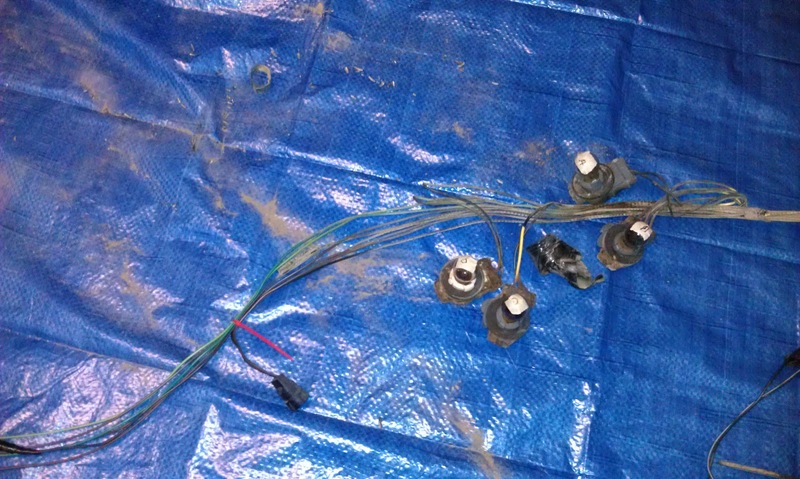 The plug did not clean up as well as the wiring did with the Gojo Fast Wipes. 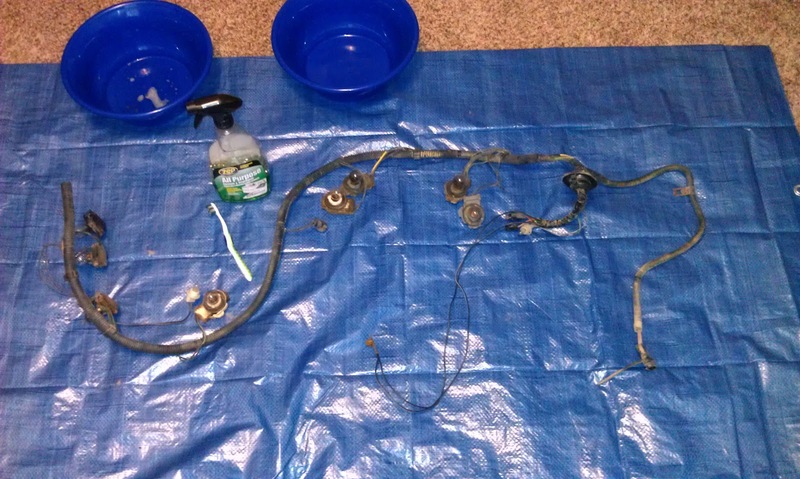 I stopped and Googled "cleaning wire harness plugs" and came across a few sources that mentioned using Gojo pumice hand cleaner to clean the plugs. Supposedly the grit helps cut through the grease and grime on the plugs without damaging them. I need to go buy some, so in the mean time I decided to just focus on cleaning the wiring. I started at each plug, tracing the individual wires as far as I could down the loom, up until it was first secured with a wrap of black tape. As I was cleaning the wire I was feeling for breaks or hard spots, which would indicate problem areas with the wiring. Once I cleaned all the wires up to this point, I removed the tape, cleaning the wires a few inches beyond that spot and then secured them using a red zip tie. I prefer to use zip ties instead of black tape when it is being used just to bundle wires and hold them in place. It is cleaner looking and does not leave sticky residue on the wires. When I ran into black tape that was actually covering an electrical connection, I unwrapped the old tape (which in most cases was already falling apart) and inspected the connection to make sure it was solid. I then wrapped it with new electrical tape and continued cleaning. I stopped cleaning just after the red zip tie in the picture above. 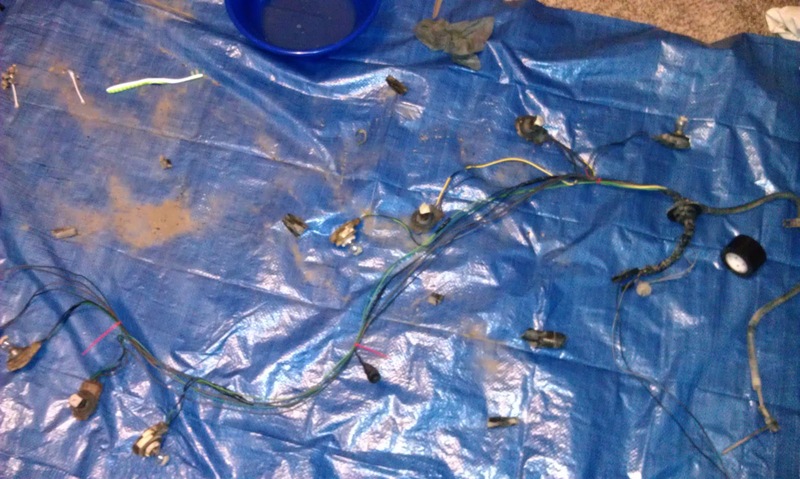 You can see how the colors of the cleaned wiring show through. There were spots on the wires where there was overspray of black paint. I did not concern myself with getting all this off, as long as I could see the color of the wire in several spots for troubleshooting in the future.